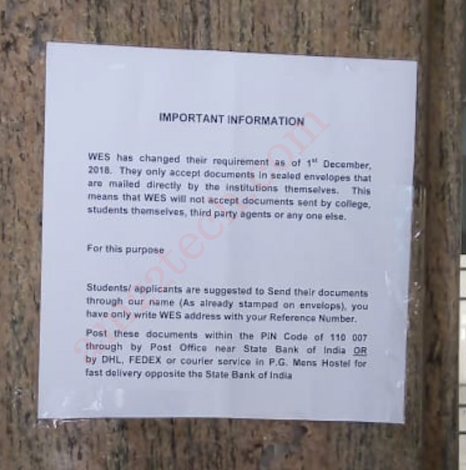 Can Delhi University Send Transcripts to WES Canada? DU has no process at this time to send transcripts directly to WES Canada on their own. But, you can send DU transcripts directly to WES Canada by mailing from DU campus Post office within pin code 110007 (Delhi). Once you get the DU transcripts sealed envelope in your hand, just write your WES reference number on top and then POST (mail) it directly to WES Canada’s official address. You can mail it by Indian Post Office near SBI Bank in DU campus or by DHL, Fedex courier near PG Men’s hostel. All thanks to Ritu Agarwal for sharing the Photo from DU office Wall. You can pay Transcript fees in INR 1000 (no need to pay in USD), collect transcripts from DU office and mail it directly by Speed Post. This is because you are collecting and mailing the sealed envelope. If you already have OLD sealed Transcripts envelope from Delhi University, you can take it to DU office. They can open it and insert your degree copy and re-seal the envelope with DU stamp. Then, you can mail it to WES Canada. Speed post courier from Delhi University to WES Canada office costs Rs. 1400. If your transcript verification request has been sent to DU by WES Canada, then you need to pay extra verification fees to DU directly. One of our guest Rohit has shared his experience of getting DU verification done for WES here (in comments). Other DD in Room No 207 for Degree Verification directly to DU once WES has sent the email for verification. DU will take 20-25 days to respond to WES once you have paid the DD fees. It is still not clear how to send this fees to DU if you are located outside India. You probably have to send someone from your family or friend to DU campus and pay this fees and attach it to your specific WES request. WES Canada has changed the process starting Oct 2018 and now requires university to send the sealed transcript envelope directly to WES. You or your friend or any third party service are not allowed to collect the transcript from university and then send it to WES. But, if your university does NOT have the option of direct mail service, you can collect the transcript from university and mail from POST office located within the campus. This way, the mail appears to have been sent by University. You can send documents or transcripts to WES from India using India speed post, Fedex or DHL courier for fast Canada PR processing. Many universities like IP university, Delhi University, MDU Rohtak, VTU does not the option of direct mailing including many others. I have done Masters from IGNOU and bachelors from DU, will I have to send two transcripts separately from different post offices as both of them don’t have the option of sending the transcripts to WES.